“NOTHING COMPARES TO BELFAB DOWNDRAFT TABLES”, CUMING MICROWAVE CORP.
Cuming Microwave Corporation – Avon, MA – is a global supplier of Microwave Absorbers, Radar Absorbers, Dielectric Materials, Anechoic Chambers, EMC Chambers for the Defense, Electronic, Telecom, Medical & Automotive Industries – A Complete Line of EMI Absorbers and EMI Suppression Materials. The organization has been using downdraft tables from Belfab for many years. “We at Cuming Microwave have several Pyradia Belfab downdraft tables and are highly pleased with them. We use them in several different production floor areas. We have large and smaller models in every division of our company. 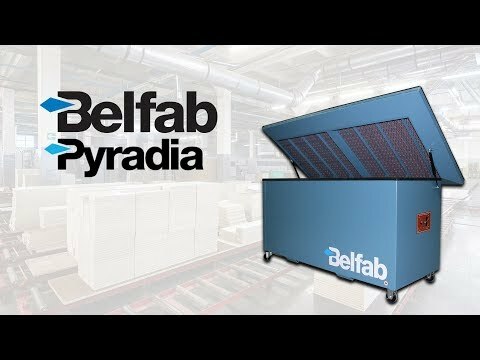 The Pyradia Belfab downdraft tables are essential to our operation and serve a very integral part of our production line”. Kevin Frost, Facilities Manager, Cuming Microwave Corporation. OUR DOWNDRAFT TABLES ARE WIDELY REPRESENTED ACROSS THE UNITED STATES AND CANADA. CONTACT US TO KNOW ABOUT YOUR NEAREST US OR CANADIAN DEALER! Please consult the brochure for specification details. Innovative anti-slip and non-scuffing mats: These robust half-inch thick mats secure parts in place and protect work from denting. Ergonomic: Special recessed base design offers foot clearance for workers comfort .The tabletop surface is accessible from 360˚ around. Ease of maintenance: The gas-cylinder assisted tabletop is fully counter balanced and auto-blocking for easy opening with one hand. This unique feature gives easy access to filters and inner chamber for maintenance. Carbon filter, bag filter, and even HEPA filter for optimal filtration efficiency are available options. Innovative design: Filters act as dust trays to capture 100% of collected dust particles. They can be easily emptied, cleaned and replaced in less than one minute! Flexible concept: Can integrate a variety of panel filter types and thicknesses that can be selected to optimize both filtration performance and durability for your application. Located on the clean side of filters for trouble free extended life. Energy efficient : more suction with 50% less HP. Revolutionary design: dual inlet blowers generating over 1800 CFM each. Airflow design generating even suction distribution across the whole top area.